Despite the possibility of record low temperatures on Thanksgiving, the annual high school football game between Braintree and Milton will take place Thursday. Despite the possibility for record lows, a traditional Massachusetts high school football game will be held on Thanksgiving after initially being moved to Wednesday. There was public outcry after it was announced that the game between Braintree and Milton would be moved up a day. 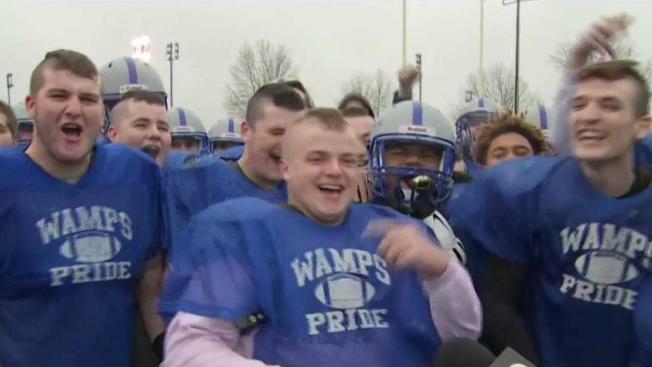 "We weren't thinking about the cold, we were just thinking about the memories and the time we have together," Braintree High school football captain Billy Silvia said Tuesday during the team's final practice before the game. Silvia says the team understands why the adults made the initial call. "We do acknowledge that it was for the safety," he said. Braintree Mayor Joe Sullivan candidly says the city dropped the ball. "But we've recovered it," he said. After looking at Thursday's bone-chilling forecast, Sullivan says school leaders moved the annual Thanksgiving high school football game to the day before the big holiday. But after outrage expressed by both teams and an online petitition, the adults agreed to change the game plan. The tradition is now back on "Turkey Day." Braintree offensive guard James Daly started the petition. "I definitely didn't think it was going to get that big," said Daly. As a precaution, Sullivan says heaters will be on the sidelines, players will be bundled up, and boxes of hand warmers will be available. The nearby field house will also be used as a warming center for fans. Milton High School principal James Jette says he's OK with this flip flop, knowing safety has always been the top priority throughout the process. The game will be played at 10 a.m. Thursday at Braintree High School.